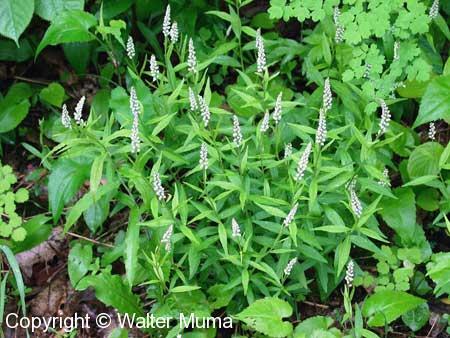 Distinctive features: Small plants, spike of small white-greenish flowers. Open dry woods. Flowers: Summer; White; Irregular flowers; White-greenish, in a spike. Small (about 1/8" long). Late spring and early summer. Leaves: Prominent central vein. Leaves become smaller towards the base of the plant. Single, simple leaves. Habitat: Forests; Dry open woods. Often along the sidesof trails. Status: Not rare, not common. Photographs: 82 photographs available, of which 5 are featured on this page. SCROLL DOWN FOR PHOTOGRAPHS. A patch of Seneca Snakeroot. You will usually find these plants growing together in a patch like this. Flowers. They are small, and white. They appear to not be open. The leaves. Note the pronounced central vein.